The main championship in 1973 was the John Player title which went into the final round with Alan Jones leading the points table by just five points from Jacques Laffite with early-season leader Russell Wood third and Tony Brise still in contention in fourth. Brise underlined his talent by winning the last round from Wood, who would have already easily clinched the title but for engine problems mid-season. Jones and Laffite both fell back leaving the Australian second in a championship he had led since May. All four drivers were expected to make it into F1 and three did: Jones became world champion, Laffite won six GPs and Brise had already joined them before his untimely death at the end of 1975. Russell Wood is a lost talent, and now a somewhat forgotten one. Despite winning a Grovewood Award at the end of 1973, he decided to retire as his wife was pregnant with their first child and he believed that to race to the best of your abilities you must have nothing to lose. Of the two junior championships, Tony Brise also won the MCD's Lombard North Central F3 Championship and Ian Taylor took the BARC's Forward Trust F3 Championship. The March 733 emerged from a highly competitive season as the leading car, having overtaken the GRD which did not evolve far enough from the successful 1972 design. The Ensign remained popular but was also an ageing design while the Brabham BT41 seemed oversized for F3 and found few buyers. Jacques Laffite proved the effectiveness of the Martini MK12 but none were sold to British drivers. The MCD John Player series ran over 14 rounds and used a 20-15-12 points system with double points at the last race. The above table is from Autocourse 1973/74 p190 and matches one constructed from the results. The other two wins in this championship fell to Tony Rouff at the high-profile British GP support race at Silverstone on 14 July and Michel Leclère when the series visited Paul Ricard on 2 Sep. The BARC's Forward Trust F3 championship comprised 14 rounds and used a completely straightforward 9-6-4-3-2-1 points system. The MCD Lombard North Central series ran over 11 rounds and used a 9-6-4-3-2-1 points system but with one or two slight complications. It looks like double points were awarded at the last race and that fastest lap was worth one or two points. 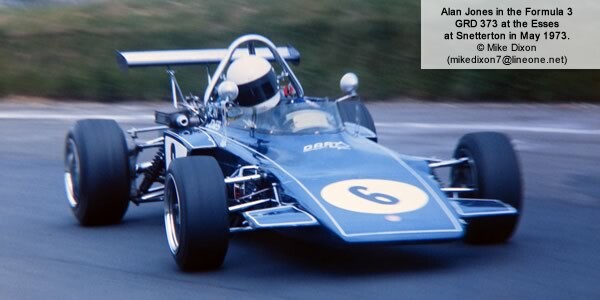 The 1973 results have been compiled by Chris Townsend using original period documents, including organisers' results sheets and practice times, and annotated programmes, plus reports in the main British magazines Autosport and Motoring News . The BARC Archive has been immensely helpful, as have the fine gentlemen of the Formula One Register. We have entry lists for all races but annotated entry lists, perhaps showing non-arrivals, non-starters or extra entries, could be very helpful.